After eight years of fundraising and hard work, the Depot restoration was completed in 2011. An exhibit created by Traub Design shows the transportation and railroad history of the valley. Come see an authentic and beautiful Depot. We rely on our wonderful volunteers to keep the building open for visitors. Call 395-8458 for Buena Vista Depot Transportation Museum hours. If hanging out in this treasured building sounds like fun to you, we'd love to add you to our list of volunteers! Admission: $5.00/adult. $1.00/youth 6-18. $10.00/family (2 adults plus kids/grandkids). Five and under are free. BVH members are free. Admission includes a visit to the Heritage Museum. BV Heritage recently (2015) acquired a vintage safe that will reside in the depot. We got it from a family in Hartsel, who had bought it from the depot in Hartsel in 1919.We needed $1500 to cover the cost. Thank you to everyone who contributed to this effort. 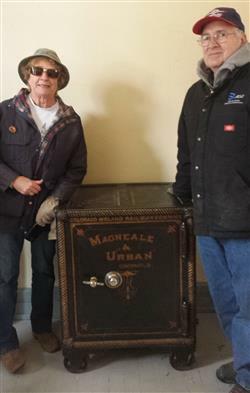 Pictured with the safe are BVH board members Suzy Kelly and Vic Kuklin, who helped with the purchase and the moving of the safe. We also sincerely appreciate the help of Bryce Kelly, Sue Kuklin, Roger Williams and Jack, Amy and Chad Close. The safe is in the depot mail room, as historically, registered mail was required to be locked up. This depot was built on East Main, approximately where the current elementary school playground is now. The first railroad in Buena Vista was the Denver, South Park and Pacific in March of 1880. By the time this depot was built in 1890-91, the railroad had changed owners and was renamed the Denver, Leadville and Gunnison RR. The railroad closed in the 1920s. 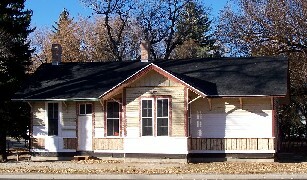 In 1927, the depot was purchased and moved to the Woodland Brook cabins. It became the residence and office. Apparently, for a while, it may even have been the local birthing house. In 2002, the kitchen caught fire, damaging the structure. Rather than tear it down, the owners offered it to Buena Vista Heritage. They included half the money needed to move it, and local businesses and individuals contributed the remainder. The Town of Buena Vista offered space in McPhelemy Park. The Depot now sits almost due west of its original location. Buena Vista Heritage restored the Depot with grants from the Colorado Historical Society, Climax Molybdenum, the Boettcher Foundation, contributions from individuals and business and volunteer labor. The restoration process was lengthy due to the precise nature of taking it back to its original condition. Older Than Dirt Construction took great care to restore the building properly. Traub Design was hired to create and build the displays located in the Freight Room. 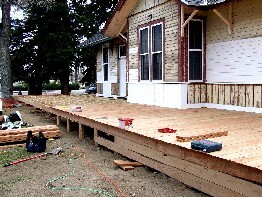 The living quarters and waiting room will be outfitted with antiques and railroad paraphernalia so visitors may step back in time and experience the depot as it was in the 1890s. Now that it's completed, the Buena Vista Depot is a transportation museum featuring the three railroads in this area’s history. 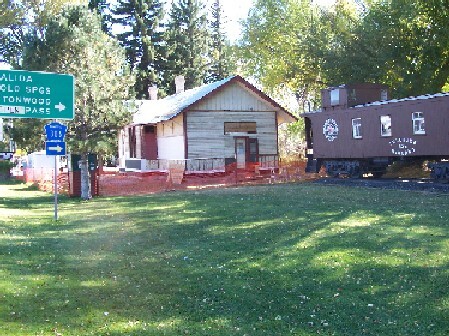 In 2005, a donor gave us a vintage caboose for display next to the depot. The brown paint represents the Colorado Midland's colors. The red on the west side reflects the CB&Q colors. This project was the State Historical Fund's spotlighted property for the month of January 2009. Click here to read the article. 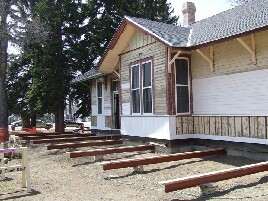 The depot restoration was made possible by the generosity of numerous individuals, as well as donations from The Boettcher Foundation, Chaffee County, the Town of Buena Vista, Collegiate Peaks Bank, and the Denver, South Park and Pacific Historical Society. The freight room exhibit, designed by Traub Design Associates, was funded through a grant from Climax Molybdenum, a Freeport-McMoRan Company. You can own a piece of local history! 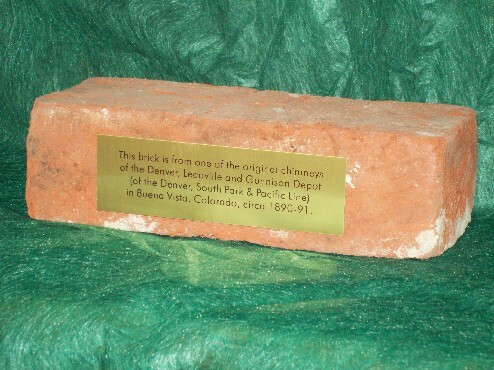 During the first phase of restoration on the Denver, Leadville and Gunnison Depot, the mason determined that the bricks from the original chimneys were not strong enough to retain for the future. So we have bricks to sell to railroad enthusiasts, history buffs and anyone else who'd like a piece of this cherished building for their own. The price is just $19.95 each plus tax and shipping and handling. If you live locally, you can pick one up at the Heritage Museum and save yourself $18 in shipping and handling. 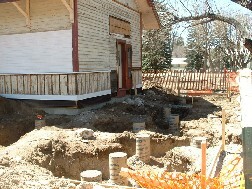 The depot platform took shape during April and early May, as the piers were poured, beams laid and boards nailed into place.